Life With 4 Boys: Neat-Oh ZipBin Review and Giveaway! Neat-Oh ZipBin Review and Giveaway! As the holidays inch closer and closer, parents everywhere are left wondering where they are going to store all of those stray toys. I know I am! Have you ever stepped on a Lego block or Hot Wheels car? They hurt! So, when I discovered ZipBin containers, I was beyond thrilled. The amazing people over at the Neat-Oh company have designed an innovative product that is both toy and storage container all in one. "Neat-Oh! International, LLC, established in February 2005, brings innovative products to market that help consumers simplify their lives. 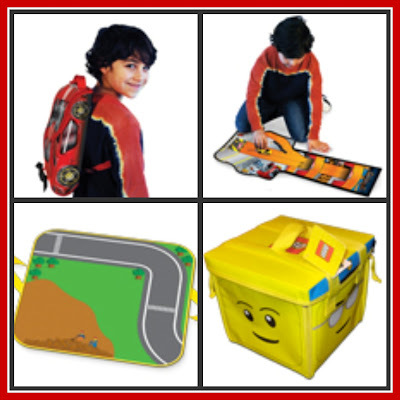 The company's flagship products are its patent pending ZipBin® line of attractively designed, transportable and collapsible interactive storage products that unzip to become activity or play surfaces, and then zip back up to storage bin form." We received both the Lego Head ZipBin and the Hot Wheels Impavido 1 Zipbin to review and I love both of these products. The Lego Head ZipBin looks small, but it holds an entire tub of normal sized Legos and quite a few Duplo Legos as well! It easily opens up into a fun playmat that my oldest loves to make villages, towns and playgrounds on and best of all, it keeps the Legos zipped up and organized when he is done! The Hot Wheels ZipBin is beyond cool! This thing comes in the shape of a race car and even has a car included with it. It unzips to reveal a race track that my youngest spends hours at a time racing his cars on. The best part is that it easily holds a few dozen cars, zips up and can be worn as a backpack for easy travel on the go entertainment. I can find no fault with the ZipBin products at all. They do exactly what they are supposed to do and add a whole new level of play to some of my children's favorite old toys. 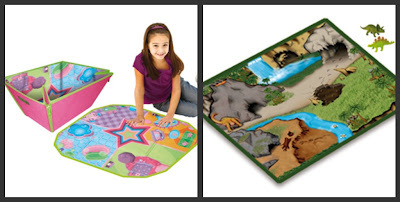 They also have products available for girls such as dollhouses and playmats for dinosaurs and other play animals as well. You can purchase ZipBin products online through their website, as well as on Amazon, where they currently have slashed prices on many items. The most notable deal right now is the ZipBin Softie Train Depot Playset , which was $24.99 and is now on sale for only $24.99. ZipBin items are also available in local retail stores nationwide and fit a variety of pricing needs. I like the lego city fireman zipbin large toy box playmat. What a clever product. I think I like the LEGO® City Fire ZipBin® Large Toy Box Playmat and the ZipBin® Dollhouse PlayPack . I like the Lego City Zip Bin! I like ZipBin on FB - Cari S.
My son just got the Racer pack for XMAS and loves it! he could use the Dino Bin also for all his little Dinosaurs! The Lego one you have pictured is brilliant, but The baskets are very nice, too. I like the ZipBin Mini Farm! Following you publicly through Google Friend Connect. I really like the ZipBin Mini Dinosaur. I'd like to get my boys the ZipBin® Dinosaur pack. I like the zip bin Dinosaur pack. the ZipBin Mini Aquarium is cool! I like the mini playset assortment. ooh i really like the hot wheels toolbox zip bin set. That looks fun! Like them on FB and commented on their wall tagging you and them. TheZipBin Mini Aquarium looks very cute! I have two boy, both with different interests, so I have to pick two products that I like the best! First, my youngest is in LOVE with Hot Wheels cars, so I would love for him to have the extremely cool Skull Tracks zip bin. I mean, it holds cars AND is a really neat ramp! My older son is a LEGOs fanatic. To the point that I step on one at least once a day. For him, I'd love the LEGO City Zip Bin & Playmat. My son just got into dinosaurs so he'd really like those zip bins. But the trucker or the airport he would love too. lego city fireman zipbin large toy box playmat. "Like" Life With 4 Boys on Facebook, widget in the sidebar.